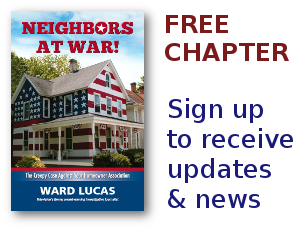 Vanitzian On Pro-Bono - Neighbors at War! QUESTION: For more than two years, I’ve experienced nothing but problems with my homeowner association board and management. They are uncooperative and obstructive. After eliminating all my administrative remedies, I now believe the only way to fix these serious problems is to sue them. I’ve interviewed three attorneys, but each is requiring a retainer of at least $20,000. Realizing I don’t have enough money to sue the board and the association, I asked each attorney to take the case on a contingency basis. No attorney would agree to that. I then asked if they would represent me “pro bono” and was told I don’t fall under that category. Why won’t an attorney take my case pro bono or on contingency? ANSWER: Pro bono help on behalf of individuals is typically for disadvantaged groups, those who are poor, disabled or elderly. The cases also tend to involve problems that have common patterns of fact that lawyers with adequate resources can handle efficiently. Because owning real property generally implies one is not poor, homeowner association cases typically don’t fit such a blueprint. And association-related problems tend to have unique issues and facts that require more time and money than pro bono organizations are prepared to invest. Contingency cases are a familiar phrase to the public because of personal-injury cases stemming from a car accident. Such cases are often referred to as “pure contingencies” because the lawyer pays everything, in exchange for getting up to 45% of any settlement or judgment proceeds. Lawyers decide to take personal injury cases provided liability is reasonably clear and the opposition is an insurer or other solvent party who can pay. Because there is an extensive body of data known to lawyers and insurers regarding the range of compensation afforded most kinds of injuries, these factors simplify the handling of personal injury cases and make them more attractive. As you can see, several levels of case evaluation are undertaken before a lawyer takes a case on contingency because there must be a reasonable likelihood of success in order to justify risking months or years of work without compensation. When an owner sues in homeowner association-related cases, the advantages inherent in many personal-injury cases are rarely present. Homeowner versus association cases — like business contract breaches, divorce and failed partnerships — are usually very complex. Predictably, these cases involve substantial paper documents, computer records and multiple people acting over a significant period of time. Moreover, the law defining fault and providing damages may be uncertain or evolving. The lawyer’s evaluation of time and expense has to account for taking multiple depositions, potential discovery battles to get records and documents, possibly poor record-keeping by the client, changes in the law and unpredictable judges and juries. Then there are boards that litigate and defend to the extreme even if it makes no economic sense — just to prove a point with a particular case and send a message to other owners thinking about suing. Whether a homeowner is suing the association or the board itself, both are indemnified so an owner is effectively suing the association’s insurance company. Though that would seem attractive to an attorney seeking ample resources to pay a judgment, it also can unduly protract the litigation. Finally, a client could render all the lawyer’s efforts for naught by failing to cooperate, or by abandoning the case because it’s too much work or stress. Many prospective plaintiffs fail to consider how much of their own time will go into a case, even with an attorney. The lawyer must consider all these variables and make a cost-benefit analysis in deciding whether to risk taking a contingency case. Ultimately, the decision comes down to the likelihood of success in obtaining — and collecting — on a favorable settlement or court award versus the hours likely to be expended. Ultimately, even the best cases have at most a 70% to 80% chance of success. And even if a case is successful, the potential award must be great enough for a lawyer to make it worthwhile, something very difficult to determine. Unsurprisingly, few lawyers take on business or homeowner cases contingently. Occasionally some cases are handled as partial contingencies, which allows attorneys to reduce legal fees. Still, clients must pay some expenses and a substantial retainer because final costs typically total in the thousands of dollars. In the end, what might at first seem like a “good case” to a lay person, when carefully scrutinized, rarely is. The law may not provide enough leverage to adequately right the wrong at issue, at least not monetarily. The unhappy reality of modern life is that legal machinery doesn’t exist to compensate people for every unkind, improper or evil deed done to them in life, let alone in a homeowners association. Biggest HOA Scandal In Colorado! There’s no way to rule innocent men. The only power any government has is the power to crack down on criminals. Well, when there aren’t enough criminals, one makes them. One declares so many things to be a crime that it becomes impossible for men to live without breaking laws.